Among the 70 contributors are Edward Lewine, author of Death and the Sun: A Matador’s Season in the Heart of Spain; Ernest Hemingway’s grandson John Hemingway, author of Strange Tribe: A Family Memoir; Michael Wigram, co-founder of 6Toros6, perhaps the most widely-read bullfighting journal in the world today; Alexander Fiske-Harrison, author of Into the Arena: The World of the Spanish Bullfight, Madrid-based journalist Bill Lyon, and Joe Distler, among the most renowned of all Pamplona runners. Ole’! Capturing the Passion of Bullfighters and Aficionados in the 21st Century is a fascinating look at the history and development of the art and skill of bullfighting. But rather than just a how-to book, Ole’! is filled with photos, drawings, and paintings of bullfighting in action, portraits of the greats, and advertisement posters. Bullfighting is best known as a sport in Spain, but is also done in Mexico and South America. 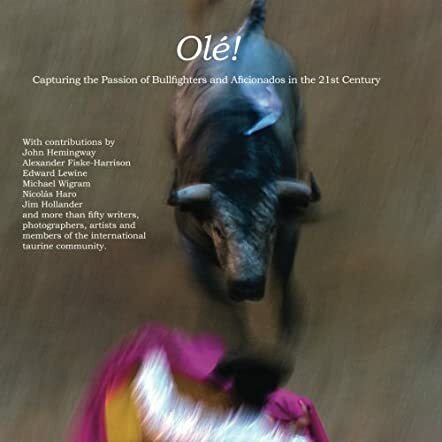 Hal Marcovitz, the editor of Ole’!, has compiled stories of bullfighters and how they became famous, and stories of fans and how they “caught the bug” or were “bitten by the worm” of appreciation (and in some cases obsession) over bullfighting. Bullfighting is a very dangerous sport and photos are even shown of toreadors being gored and tossed in the air. Something interesting I learned was that one cannot eat a meal before taking on a bull, since if they were gored in their digestive tract and it was not empty, toxic wastes would get into their blood stream, worsening the chances of a fatal infection. Hemingway set four of his novels in Spain and involved bullfighting in their plots. Many people think they can read his work and then see a bullfight and understand it better. In fact, Marcovitz states it is better to reverse this order. If I am ever in Mexico or Spain, I will try to see a bullfight, even though I will likely be distraught at the sight of the death of the bull, or even more so in the event of an injury to the bullfighter. Ole’! is very interesting to read, although something about the font made reading difficult. It is easy to pick up and read just one of the more than 60 segments and learn something about this novel sport, and maybe about yourself.